As you prepare your indoor seed-starting operation, you may have many different seeds you desire to plant. Some seeds germinate more easily than others, but most seeds will root readily using moist paper towels. When you saturate paper towels with plain water and use them to create a germinating environment for seeds, this damp environment is suitable for keeping seeds warm and moist. Use paper towels when starting seedlings to create a suitably wet environment. Cut paper towels in half. You will need a half paper towel for each plastic bag of seeds. Fold each halved paper towel in half and insert each into a plastic bag with the folded edge going in the bag first. Make sure the paper towel lays flat inside the bag. Lay the plastic bag flat onto a work surface and open the bag and the paper towel inside. Insert seeds into the bag between the two folds of the paper towel. Space the seeds approximately 2 inches apart on the paper towel to keep the roots from interfering with each other. Pour approximately 2 tablespoons of cool water over the paper towels to saturate the paper towels. Close the plastic bag, making sure you seal the bags flat with no excess air inside the bag. Label the bags with the permanent marker so you know what seeds are inside the bags. Place the plastic bag in a location with the temperature appropriate for the seeds you are germinating. Some seeds require warmth--place these seeds on top of the refrigerator. Some seeds require cooler temperatures--place these seeds where the temperature is approximately 70 degrees (such as a kitchen counter or cupboard). Consult seed packets if you are not sure of the seed requirements. Check the plastic bags for seed germination after four or five days. Look through the side of the bag without opening the bag. You should be able to look through the paper towel layer and detect sprouts on the seeds when the seeds germinate. Continue checking the bags until you see germination. 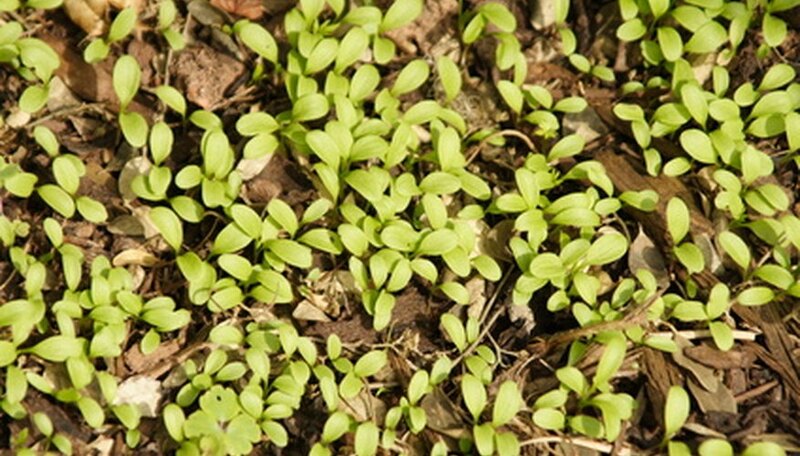 Move the sprouted seeds to potting soil in seed-starting trays when the seeds have 1 to 2 inches of growth. Carefully open the bags, and transfer the sprouted seeds from the paper towels to the soil. Firm the soil gently around the roots of the sprouted seeds and water the soil to make it moist.